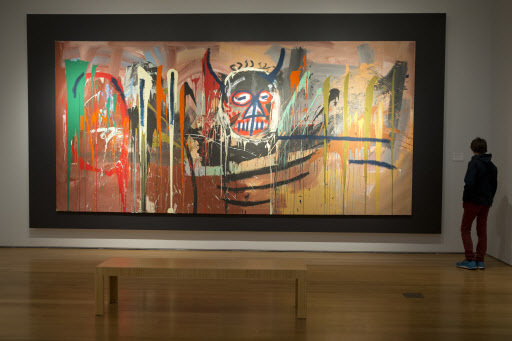 NEW YORK (AP) -- A monumental self-portrait by Jean-Michael Basquiat set a world auction record for the artist at $57.3 million Tuesday evening at a Christie’s contemporary art sale. Basquiat’s self-portrait, “Untitled, 1982,” portrays the young artist as a fiery, demonic figure. The canvas, which features splashes of explosive colors, has appeared in every major Basquiat retrospective. It was created just six years before Basquiat died of a drug overdose at 27. The sale exceeded the auction record for the artist, which previously had been $48.8 million. The painting had a presale estimate of $40 million. Other top lots included a large blue and green painting by Mark Rothko, an important work by the abstract expressionist artist Clyfford Still and a group of nine sculptures by Alexander Calder that were inspired by his visit to India in 1955. Rothko’s “No. 17” brought in $32.6 million, falling between the estimated sale price of $30 million to $40 million. The oil painting’s two large color panes, one electric blue, the other dark green and separated by a horizontal azure blue bar, has an extensive exhibition history. It was created in 1957 and included in a Rothko retrospective that traveled across Europe between 1961 and 1963. When the exhibition opened at the Whitechapel Gallery in London, it was the first time that much of the British public encountered the American artist’s work. Brett Gorvy, international head of Christie’s contemporary art, said it was a seminal exhibition that positioned Rothko as a leading figure of the Abstract Expressionist movement. The artist, who died in 1970, has huge global appeal. His “Orange, Red, Yellow,” which sold for $86.8 million in 2012, holds the auction record for the artist. Rothko painted “No. 17” during a brief period when he was using lighter coloration and just months before he began work on his famous, darker and intense, Seagram Murals series that he later donated to the Tate museum in London. The work was acquired by an Italian collector following the retrospective and remained unseen by the public until 2001 when it appeared at another major Rothko exhibition in Basel, Switzerland. A short time later it was purchased by another collector who sold it Tuesday. Calder’s group of hanging and standing mobiles brought in more than $28 million. “Sumac 17,” a hanging mobile constructed of sheet metal, wire, rod and paint sold for $5.8 million. The works, coming to auction for the first time, were created during a three-week trip that Calder took to India at the invitation of the Sarabhai family. Two of the family members founded the Calico Museum of Textiles and the National Institute of Design in Ahmedabad, India. The auction record for a Calder mobile is $25.9 million. One of the few remaining Still paintings in private hands, “PH-234, 1948,” sold for $28.2 million. The current auction record for the artist is $61.6 million. Dominated by a deep blue color and featuring expressive brushwork, it was included in a major retrospective of the abstract expressionist’s work at the Hirshhorn Museum in Washington, D.C., in 2001. In nearly 60 years, the painting has had only two owners, Christie’s said. Most of Still’s works are in collections and museums, including at the Clyfford Still Museum in Denver, Colorado.